This page speaks for itself, I think. The cape and hair makes it. I mean really? What kind of form WOULDN’T have his marvelous locks? Hmm, it does look a bit sideways, though. Sideways? I did curve it back (sort of like Bowser’s hair) because it looked better that way. For some reason his regular hairstyle looked dorky on an actual shark. It’s behind his dorsal fin. Yeah, somebody has me covered. Maybe if it had a part or something, to show the sweeping?… Hm. I see why you did this, every version I imagine looks weird. he looks so happy! i never thought this would happen it is amazing! I always hoped we’d end up here someday, but I didn’t know when we’d get the chance! Skärva’s grin is amazing. It also seems to have migrated to my face. This entire page is awesome. Princesses shelter their little bird friends from a shirtless shark endboss all the time. How will Blank deal with a SHARK in its NATURAL HABITAT??? Looks like a clockwise whirlpool end-fight, judging from the banners. For bonus points, neither Blank nor Skärva get even a drop of water on the princess the whole of the second form. 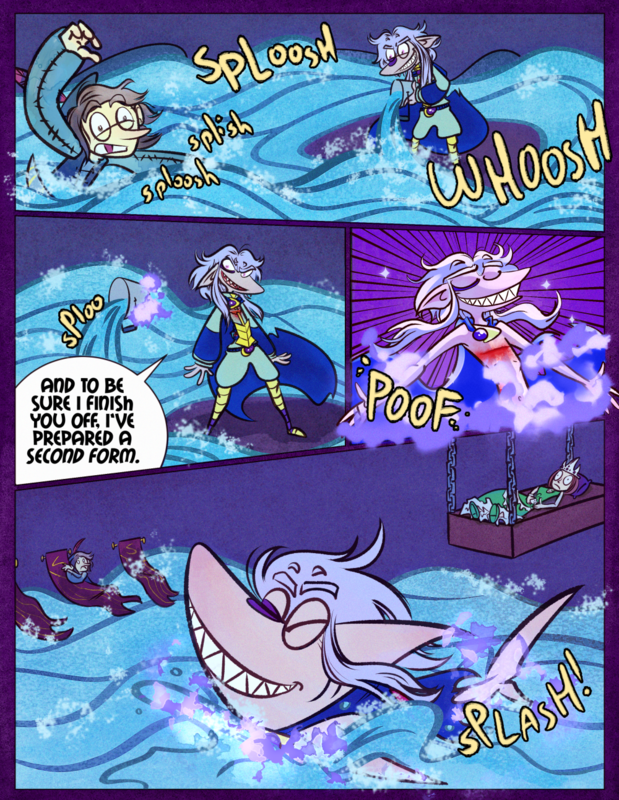 So light magic can turn people into giant sharks? Interesting. Seems like transformation would be one of those super-difficult magical feats though. Oh right! The bucket is still making water, so this is technically a timed boss battle. At some point the chamber is going to be filled, and Skärva will still be a shark. Unless the door is opened again. Light magic? What makes you think it’s light magic? But you’re right, transformation like this takes a large amount of skill and preparation. Just remembering that light magic can do almost everything that dark magic can, which could potentially lead to one of those ‘the hero turns into a lot of things magically during the quest’ games. And that slab CAN’T be comfortable. THERE ARE NO WORDS to express how AMAZING this scene has very rapidly become. I made the mistake of checking for a new page just before class. I now have people staring at me for spontaneous laughter. This is my all-time favorite page. Shaerva? Skaerk? What do we call this new, magnificent creature? I was still kind of hopping for a giant puppet shark but this blew me away. He only poofed away his shirt, right? RIGHT?! Goodness, no wonder Princess Veronika looks so shocked. Does he LOOK like he’s wearing pants? I’m pretty sure the magic covered everything up though. Ha! No, the top and the poofy shorts are actually separate, believe it or not. The minions probably don’t appreciate it very much though. Looks like shark meat tonight. And rice pudding, of course. Aww, Shark-va is the happiest he’s ever looked. Look at that huge grin! And those huge teeth. Hmm. Well, only with extensive preparation! Not whenever he so chooses!